This 3200 sq. ft house was designed for a former Vice Chancellor of Mysore University on a site of 50’ x 80’. Small patches of three green courtyards were carved out of the site to be accessed from living and dining rooms. The roof is made of hollow clay block vaulting and brick doming with out centering. A wood bridge over the living connects the front and rear rooms in the first floor. Sky lighting is used with advantage. The house incorporates rain water harvesting and solar water heating. “Hegde Residence at Mysore is a departure from the archetypal visual and spatial idiom of local architectural expression. Curvilinear forms are used… to form a cascading composition of roofs. 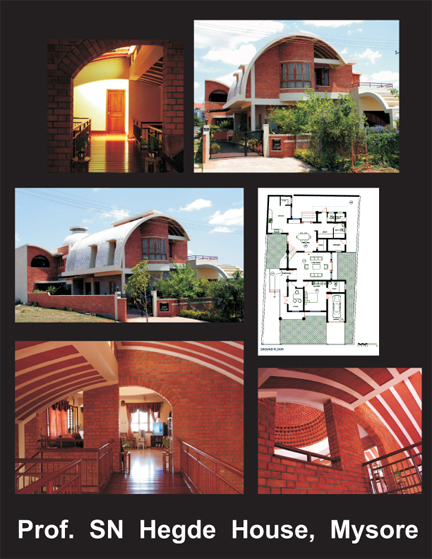 Awarded IIA 2009 Award for Excellence in Architecture by Indian Institute of Architects.